We’ve been flooded with emails and comments that Google will be selling the base Pixelbook for $700 for the Black Friday shopping madness. Originally shared by BGR, I’ve been digging around to figure out where or when Google actually announced this but I’ve come up empty-handed. Not to be daunted, I continued to poke around and thanks to Best Buy’s Black Friday flyer, we can now confirm that Google’s Pixelbook will be $300 off the original retail price starting Thanksgiving day and run through the 24th at Best Buy. Given that Best Buy is one of Google’s official retail partners, it is very likely we will see this deal at the Google Store and Amazon along with other sellers such as BH Photo and Adorama. 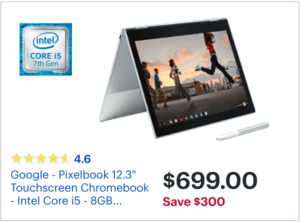 This deal comes in $50 cheaper than last year’s Black Friday deal on the Pixelbook and puts it in the running for the best deal going this year. Sure, there are 8th gen devices out there and you can even pick up some of them at a discount at the moment but this is the Pixelbook. I’ve used the Acer Spin 13 and the Dell Inspiron and despite being well-built powerhouses, there’s just something about the Pixelbook that sets it apart. $700 is worth every penny for Google’s flagship. We’ll be tracking all the good Chromebook and MadeByGoogle deals as they pop up this week so make sure you bookmark our Deals page and get in on the savings. The Pixelbook currently comes with 3 free months of YouTube TV for new subscribers. If you already own a Pixelbook and would like to try out Google’s streaming TV service, you can redeem the deal here. If you’re in a hurry and don’t want to wait, the Core i5 Pixelbook is already discounted a respectable $152 off at Amazon. You can find it at the link below but I’d definitely check back on Thanksgiving if you want to make the most of your money.